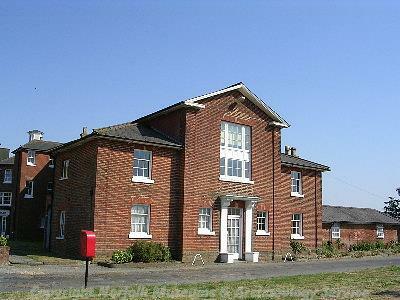 Built in red brick in 1836, this former workhouse has three storeys and wings radiating from a central rotunda with cupola. The wings end in houses with pedimented raised central bay, and at the corners of the outer wall enclosure, there are defensible gun turrets with vertical slits, one with a chimney. To the north lies a simple brick Gothic Revival chapel, of later date, from which was taken an interesting panel depicting an angel leading a woman away from 'symbols of darkness'. Former workhouse. 1836 by Thorold. 5 June 1980. Site visited by E. Rose. Red brick, three storey wings radiate from a central rotunda with cupola. Wings end in houses with pedimented raised central bay. At corners of outer wall enclosure, defensible gun turrets with vertical slits, one with a chimney (but east wall and southeast position part demolished). To north simple brick Gothic Revival chapel, of ?later date. Now a hotel, this building's claim to historical importance is that it was the NAU's first headquarters. Machines from laundry in Gressenhall Rural Life Museum. Addenda: The Houses at the ends of the wings were originally joined by buildings to produce an octagonal building divided into four quadrants by the cross. The north-west quadrant has been demolished. See (S1) and (S2) in secondary file. 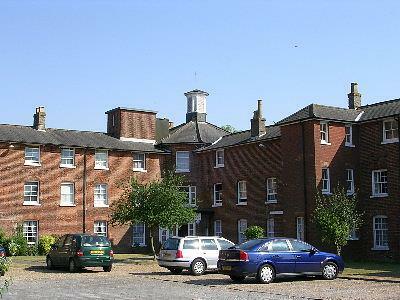 The workhouse has now been converted to flats, and a garden centre is situated in front of it. R. Fillery-Travis (NLA), 11 December 2006.
overall octagonal plan. The west wing facing front has pedimented gable, large first floor sash window with glazing bars and margin lights and doorway with cornice hood on large brackets, flanked by lower two-storey one window wings, sashes with glazing bars. Detailed photographs of steam machinery in NIAS records. --- Aerial Photograph: TM1887 D,K-M.
<S1> Newspaper Article: 1988. Eastern Daily Press. 2 June. <S3> Scheduling record: English Heritage. National Heritage List for England. <S4> Archive: NIAS. Norfolk Industrial Archaeology Society Records.